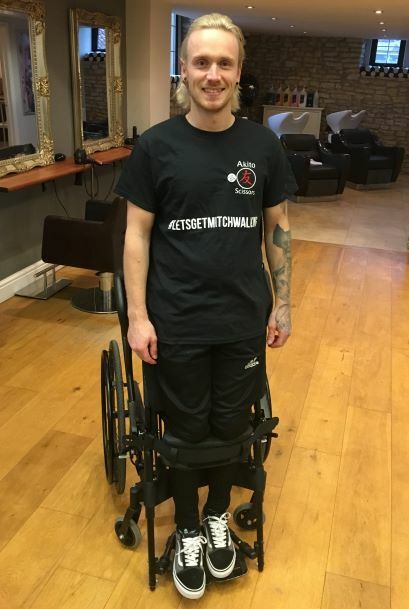 Through sheer determination Mitch has since re-trained and pursued his dream of becoming a hairdresser and with the aid of a stand up wheelchair Mitch now works full time as a stylist at James Christopher Hairdressing in Midsomer Norton. To date, Epidural Stimulation is t he most advance treatment for Spinal Cord Injuries available. Akito Scissors are planning a number of fund raising events throughout 2019 and would welcome fellow hairdressers and barbers to get involved. To start off the campaig, Ben Brown has kindly donated his original pair of Akito F-2 black 5” scissors to the campaign. Ben purchased his scissors in 2017 and has since used them in his educational videos where they have been viewed worldwide an amazing 4,000,000 times!